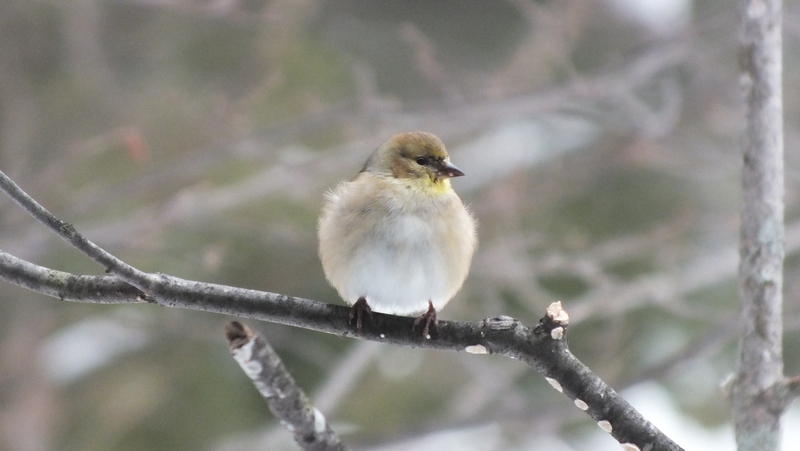 We’ve had a great winter of bird watching here at Sweetfern. For the first month or so we saw very little. Sure, I’d glimpse or hear nuthatches, chickadees and woodpeckers during my walks, but never saw a single bird from the house. So I made a couple of changes. First, we set our cut Christmas tree into a pile of rocks off the back porch. Second, I threw birdseed on and around it. And third, we added a suet feeder to a tree out front. Within days, voila’! Birds! Of course the bird feeding stations aren’t the only bird attraction within sight of the house. We have a huge standing dead maple directly out front, a grove of mature white pines between us and the lake, and an entire mixed hardwood forest out back. 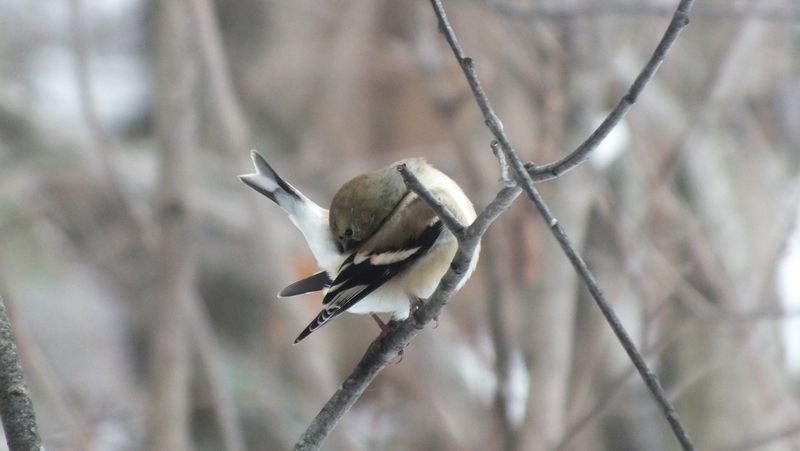 So here’s a look at the Winter Birds of Sweetfern, at least the ones I have managed to get photos of. Always dependable feeder visitors, even here in the woods, the chickadees were first to arrive at the suet feeder. Chickadees prefer to take their food to go, loosening a sunflower seed or bit of corn and either eating on a nearby branch or stashing it in a tree crevice until later. First to arrive and take over the Christmas tree and the birdseed around it were a flock of about 8 Northern Juncos. 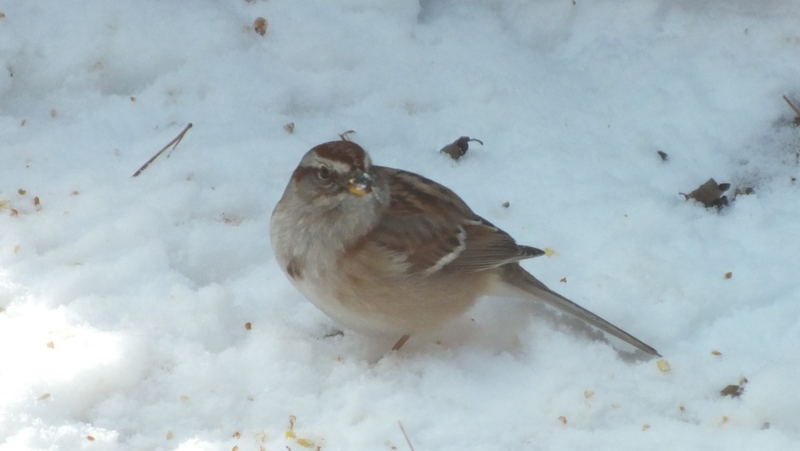 These ground-feeding “snowbirds” do a little 2-footed scratchy dance in the snow to dig out the seeds, sometimes digging little trenches as deep as themselves. 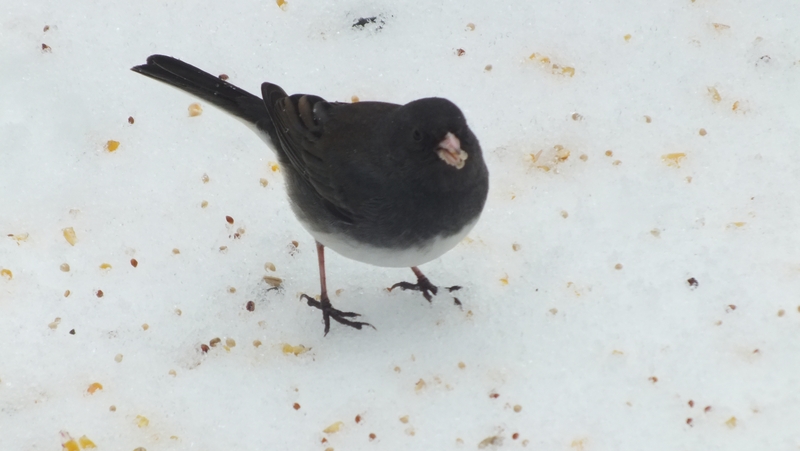 Most US juncos spend summers in the far north of Canada and southern Alaska. Happily, ours are year-round residents. On a walk last week I recorded a bird call I didn’t recognize. 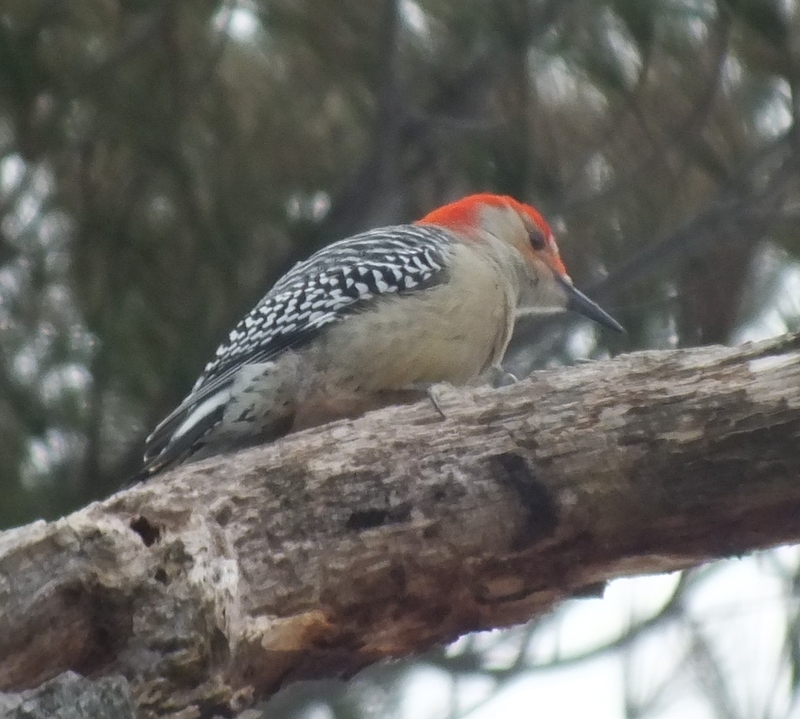 I couldn’t track it to a bird but after a bit of online research at home I found it was a red-bellied woodpecker. The call I heard matches THIS ONE. 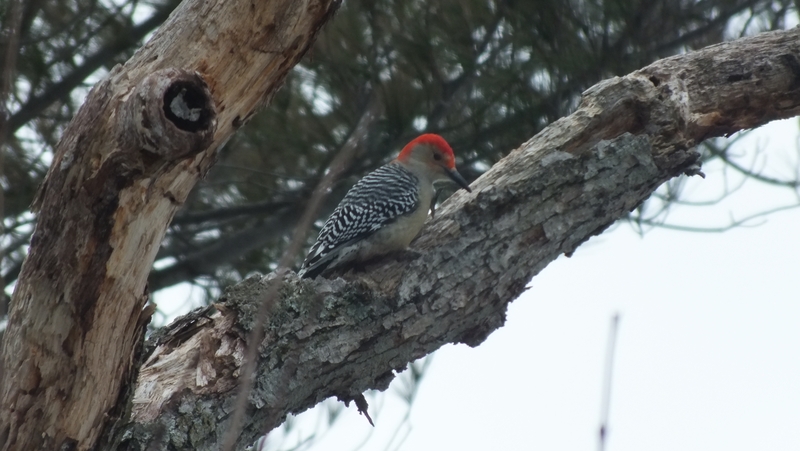 The bird in my photo is a male because his red cap extends right down to his beak. According to the Audubon map, red-bellied woodpeckers are “uncommon” here but are steadily moving north. Well, there goes the neighborhood. 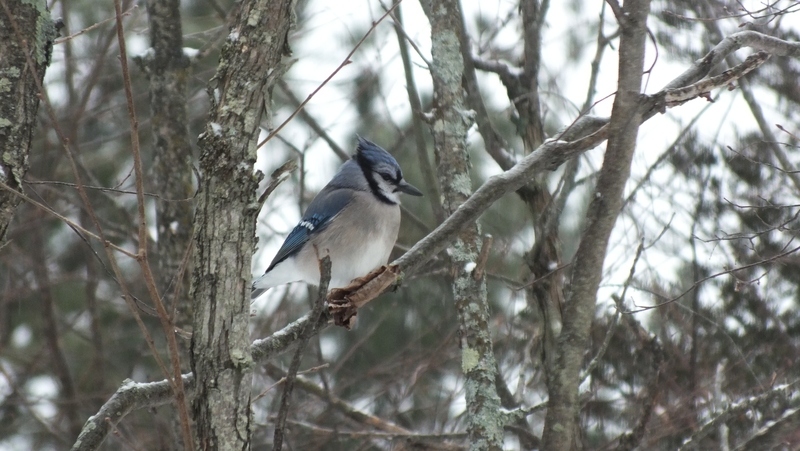 A boisterous trio of jays arrives loudly several times a day to chase everyone off the suet feeder. As a forager of acorns, jays are credited with the spread of oak forests. One study found that 50 jays transported and cached 150,000 acorns in 28 days. Not only do jays plant them, but acorns stored by jays have a higher rate of germination than those stored by squirrels. 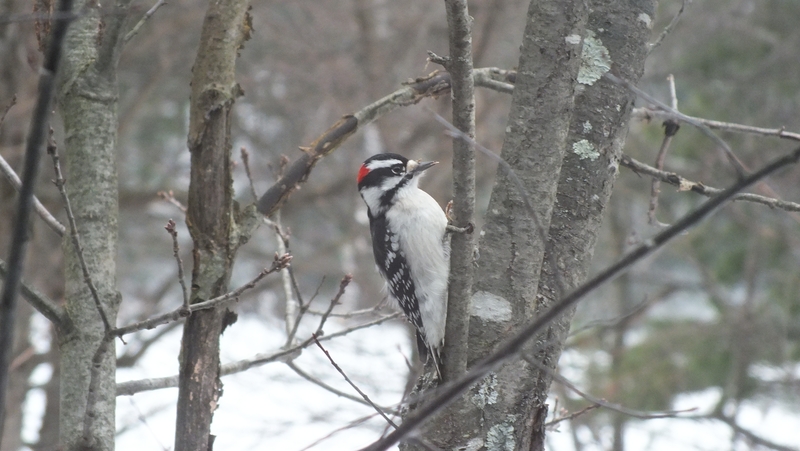 These little woodpeckers had the hardest time trying to reach the suet. While everyone else came around front and climbed onto the suet or plastic frame, these birds kept trying to come at it from the back, working to hammer their way through the plastic. It wasn’t until I watched for awhile that I realized, they were reluctant to let go of the tree trunk. And when they did, it seldom went smoothly. These trunk-climbing birds are really hard to get pictures of! They never stop moving and, able to ascend or descend headfirst, they circle the tree trunk, disappearing behind it and coming back around some 3 feet higher or lower than where they started. 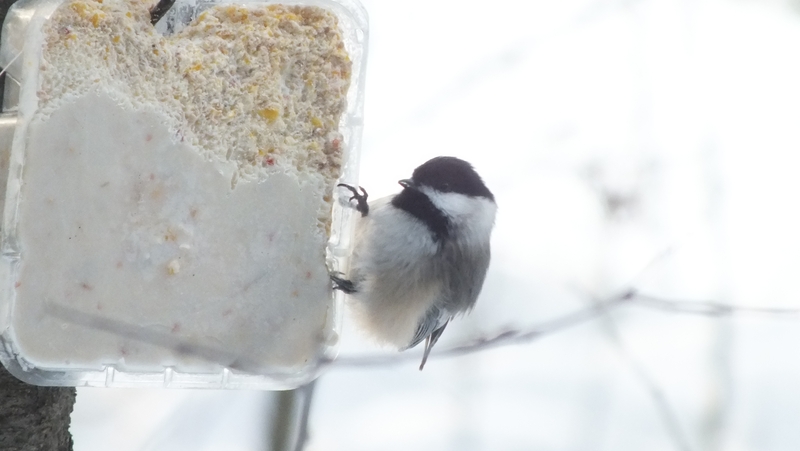 Like the chickadees, they often take their meals to go. Here’s a Little Brown Job (LBJ) — a generic term for everything that looks like this. I’m really poor at ID-ing these on the fly, but now with photos and field guide at my fingertips, I’ll throw a guess at it. Let’s see .. rusty cap, wing bars, darkish eye-streak, dark mark on breast — I’m going with American Tree Sparrow (Spizella arborea). 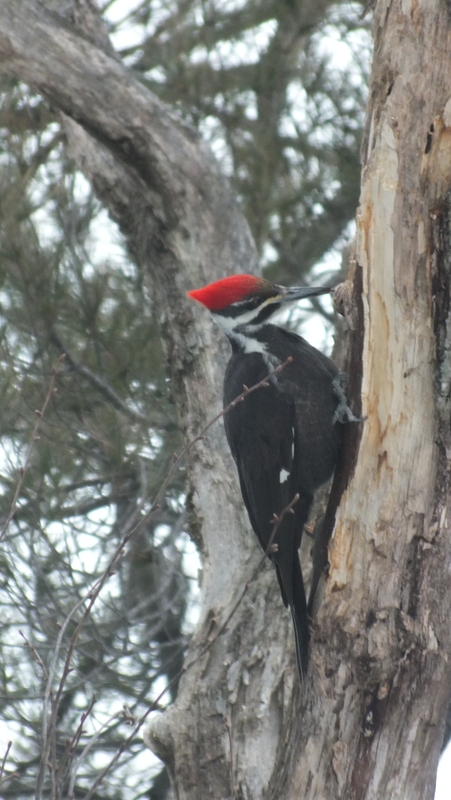 These enormous birds are the largest woodpeckers in North America. Deforestation during the late 19th and early 20th centuries drove their numbers downward precipitously. Over the last century they have made a slow comeback. Still considered uncommon this far north, it’s a privilege to have one (or maybe a pair) resident here. 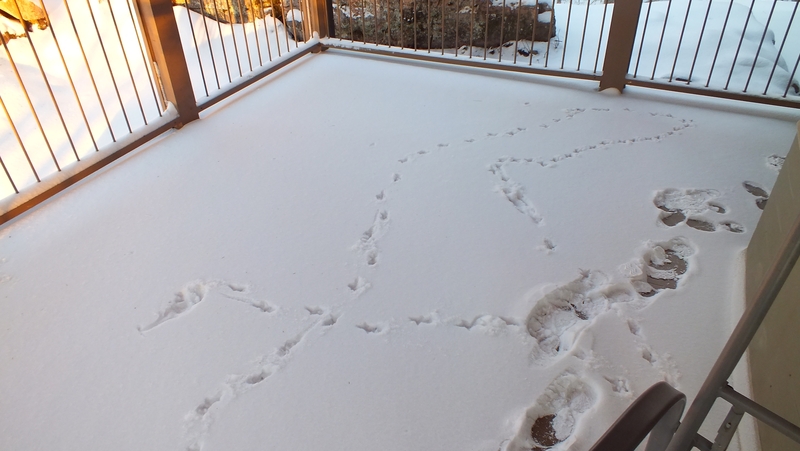 I met this bird for the first time when I spotted “chicken” tracks in the light snow on my back deck. I went to the glass door to investigate and flushed the bird off the doormat where she had been resting in the sun. 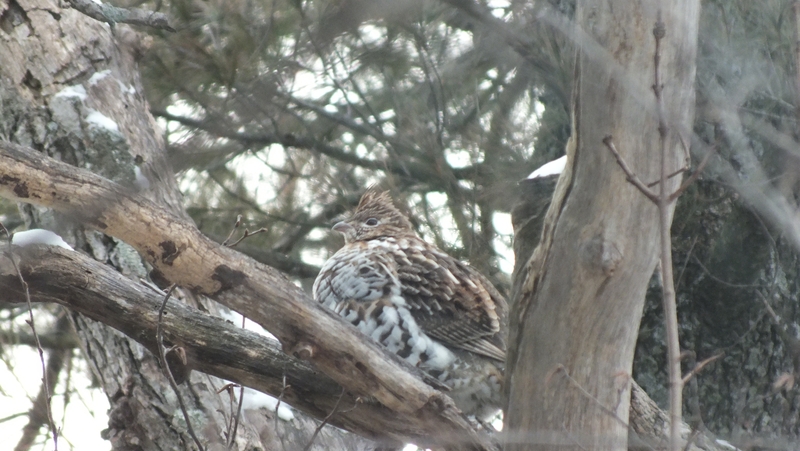 I can’t even believe I saw this bird, much less that I got a photo of it. Look at that camouflage! Only because it flew from the front of the house right up and over my windows, did I even realize it was there. I dashed out onto the porch and had almost decided it was gone when I spotted in the tree. I knew we had owls because I found an owl pellet our first summer out here but this is my first confirmed sighting. 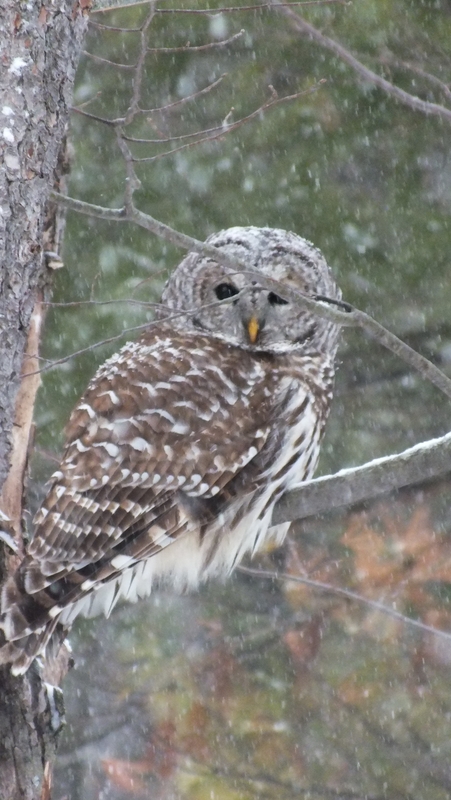 So readers, what birds have you seen this winter? Anything cool or out of the ordinary? Unfortunately most of the urban birds I get here in the UK consist of seagulls and pigeons… I need to get out into the forest some more. I miss the birds! 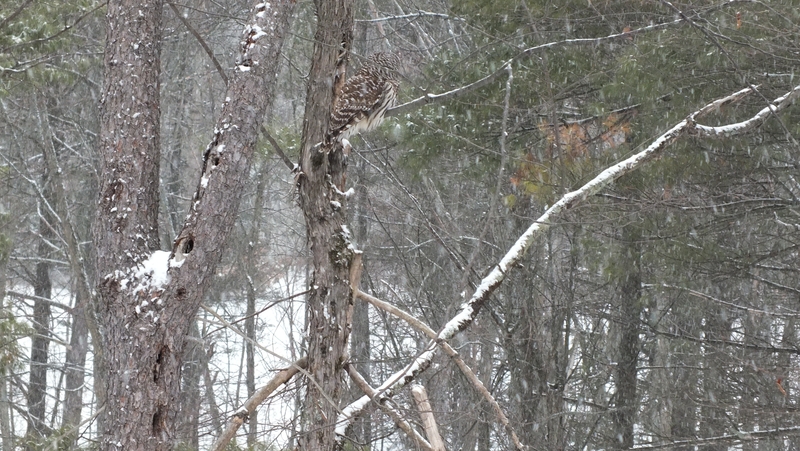 Love all the pictures (particularly the Downy and the Barred owl)! Moreover, your conversational tone and interesting facts were like having you here for coffee. It will be nearly 70 this weekend. Want to hop on down? 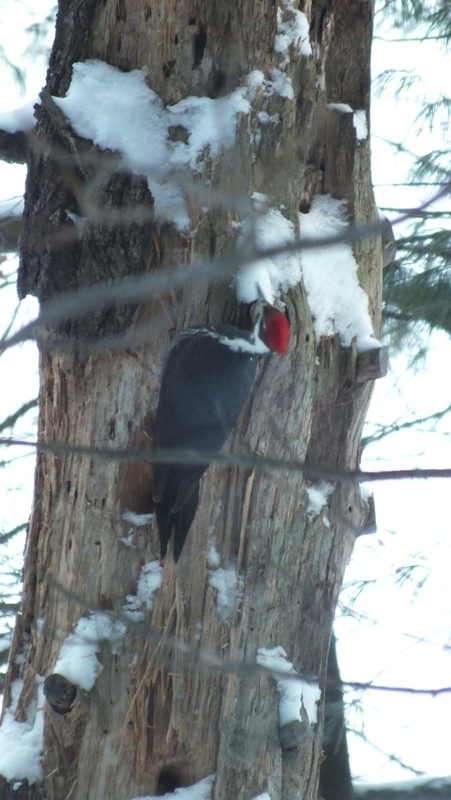 Our cottage in the Haliburton Highlands had a pileated woodpecker that loved a dead tree behind our property. We loved hearing its crazy call and staccato woodworking, but we didn’t see it last summer. Maybe it moved to Sweetfern because it heard the ambiance was better. 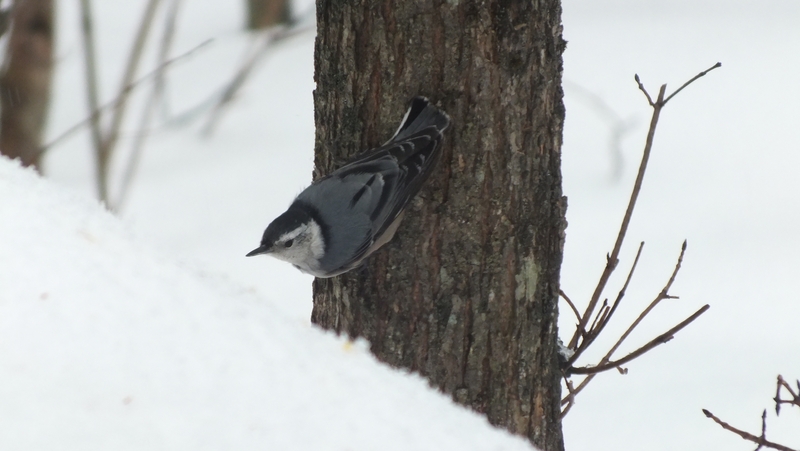 But I must say I’m impressed that you got a nuthatch to be still enough to capture through the lens. Today’s sighting in Durham Region: A hawk perched on a light post on Rossland Road and in the pine trees behind it, a raucous and rambunctious gang of crows, unnerved, no doubt by that bird of prey’s proximity. Margo: YES! Just no tornadoes, ok? Ruth: I love counting hawks by the 401 between Kingston & TO. Usually spot a good half dozen or more. Heading to the city by train this wknd. Will be too dark Sunday night, but maybe will see some on the return trip Thurs afternoon.